Recognizing that healthcare works in the best interests of the patient when hospitals engage in meaningful collaboration, University of Cincinnati Medical Center and Cincinnati Children’s Hospital Medical Center have developed a unique model of care to ensure your smooth transition into adult healthcare. Throughout your journey of care at University of Cincinnati Medical Center, you will be guided by a team of highly-trained physicians, nurses, educators and support personnel dedicated to ensuring you receive the absolute best care and service available. This team will be your point of contact for any questions you may have related to appointments or other areas. By joining together, we are combining the power and expertise of Cincinnati Children’s, ranked No. 3 in the nation on the U.S. News & World Report’s 2011-2012 list of best children’s hospitals, with that of University of Cincinnati Medical Center, consistently ranked in the U.S. News & World Report’s annual guide toAmerica’s Best Hospitals. Under this umbrella, we will help you manage your condition, providing ongoing care and resources to empower you and put you on a path to a healthy life full of possibilities. Our tradition of excellence consistently places University of Cincinnati Medical Center among the top hospitals in a variety of rankings and award listings. On behalf of UC Health, welcome to University of Cincinnati Medical Center and thank you for trusting us with your healthcare needs. make your transition from pediatric to adult care as smooth as possible. give you the tools you need to successfully take charge of your health. treat you as we would like to be treated and to provide you with the very best care possible. 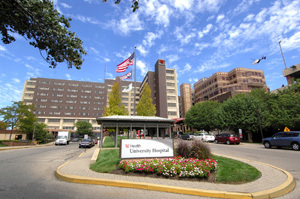 University of Cincinnati Medical Center was founded in 1823 as the teaching hospital for the University of Cincinnati College of Medicine. It was the first hospital in Ohio, and the first teaching hospital in the United States. 1970: Founded the nation’s first Emergency Medicine Residency Training Program. 1984: John Tew, MD, neurosurgeon, became the first in the country to use the YAG laser with FDA approval. The YAG laser was used to vaporize brain tumors previously considered inoperable. Late 1980s/Early 1990s: Pioneered the use of tissue plasminogen activator for the treatment of patients with ischemic stroke. 2002: In conjunction with the University of Cincinnati, garnered international attention by identifying two genes which increase the risk of heart failure.